Our Sonoran Desert Wildflower seed blend is a 100% native seed blend that is custom designed for the Sonoran Desert (see distribution map). We thoughtfully selected wildflowers that are appropriate to this area and that provide a variety of bold and delicate blossoms; with both early and late blooming wildflowers for color through the growing season. This blend has been designed with an emphasis on native wildflowers and with special attention to balanced percentages of annuals and perennials. Additionally, this mix is designed to be adaptable to a wide range of conditions within the geographic region shown on the distribution map. 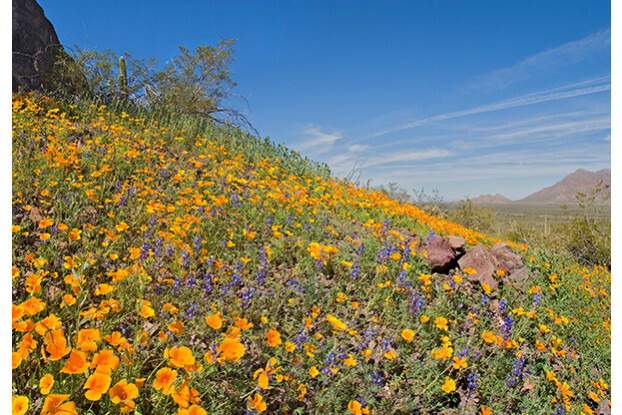 The colors in bloom will vary at different times of the year, and depending on how much water and sunlight are available to the wildflowers. The colors which you will see at different times of the year will include: yellows, purples, reds, oranges, pinks and whites.